2010-03-08 - Columbia, KY - Photo owned by Gene Jessee. 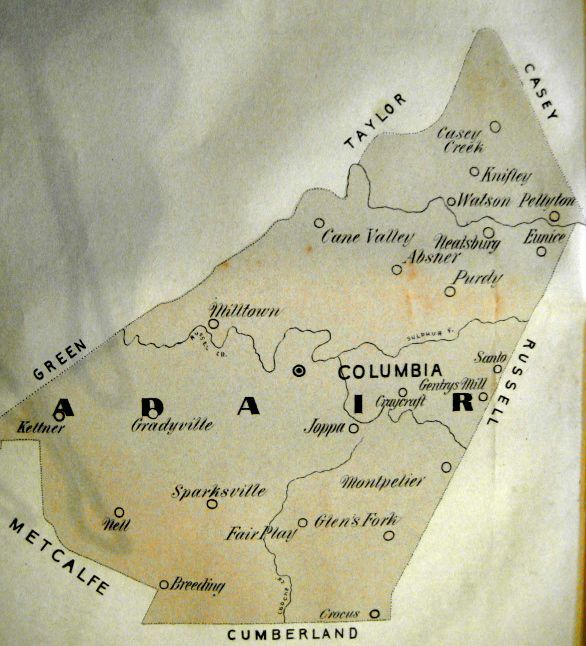 Gene Jessee's 1897 map of Adair County, KY, clears up a lot about just where in the world the Village of Craycraft is located. Spellings and names have changed over the years. It was "Fair Play," not Fairplay. The Village of Neatsville, was "Neatsburg," on the map. Glensfork/Glens Fork/Glenville/Village of Hardscratch had an apostrophe in those days. And Watson, hardly remembered anymore, is as prominent on the map as Knifley. And, what looks to be "Santo" on the map is near today's Russell County Community of Sano.